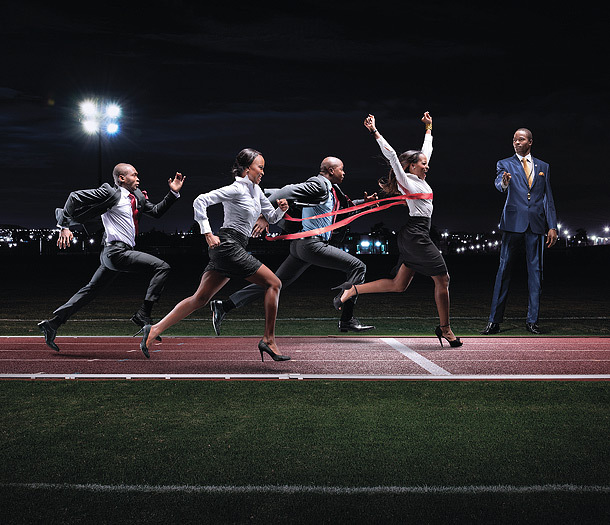 High speed stills of athletes dressed in suits. 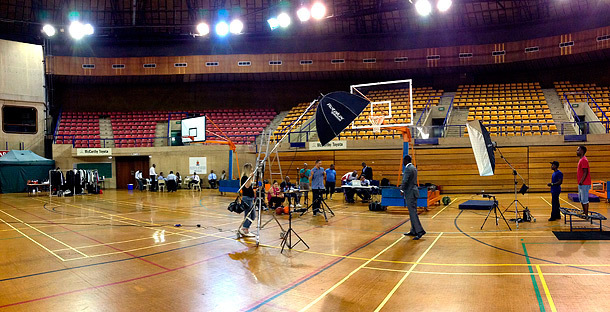 Challenge: Athletes need to be shot in studio, as filling stadiums with tens of thousands of people is not an option. 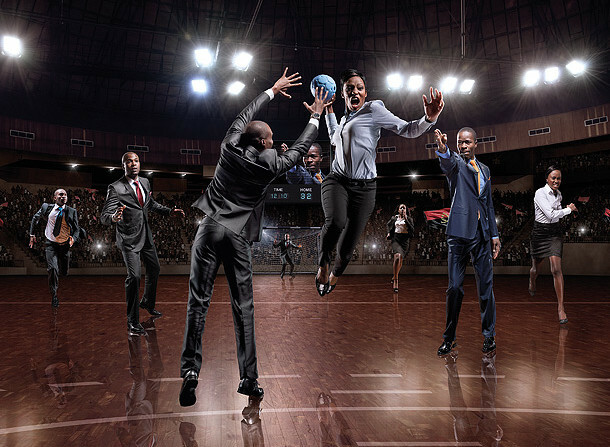 So, shoot athletes in studio, then shoot the stadiums and backgrounds separately and create composites in post. 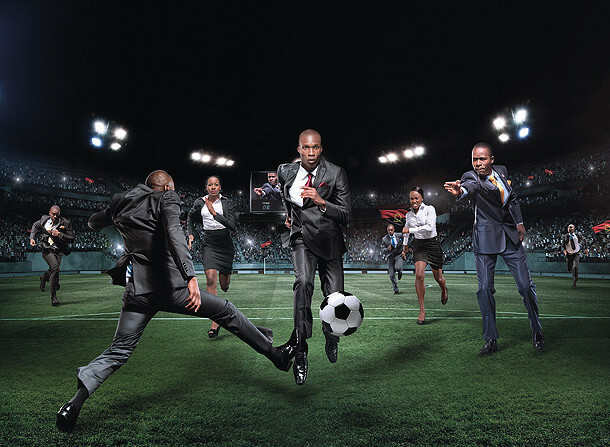 Ministry of Illusion handled the video side, cast the models and sourced locations. Paulo, fresh from an exhausting plane trip, would art direct. Working with a CD with such immense experience introduces various dynamics. It’s a given that everyone works hard, exhausting all possibilities until the most realistic and true-to-genre images are achieved. The biggest benefit the art director brings to the shoot is the creative eye that grinds aways at the look and feel and hones it into a finely calculated visual. We wanted results that looked the part. All models were real athletes and performed at high speed. 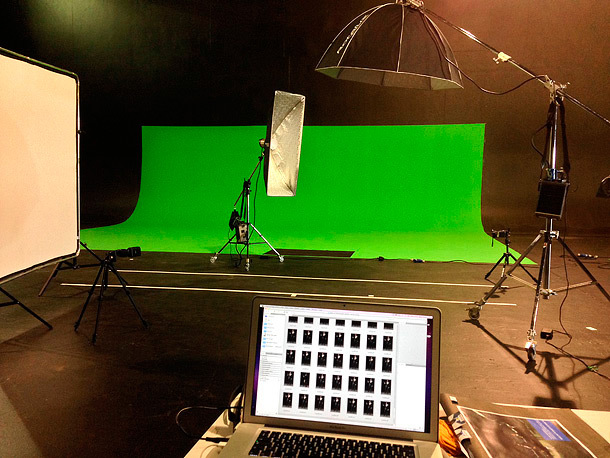 Each individual athlete had to be photographed at least 50 to 60 times to capture the optimal moment that portrayed his/her role in the composite image as realistically as possible. Limbs had to be powering through the air and coordinated to enable us to capture the moment of utmost exertion and accuracy relating to that specific sport. Credibility is critical, especially to those in the know who crit the images. Heads had to be angled precisely, eyes had to be focussed on the point of action. Only a small number of final images met these criteria and were available as final options. No point in shooting multitudes of images and tiring an athlete, yet missing a small detail that makes the image unavailable for final selection. Once all the images are introduced into the final layout, the composite image is only successful if all the models work together to tell a story that is plausible and visually stimulating. For first time readers of this blog, i would like to stress the importance of the right kit for the job. 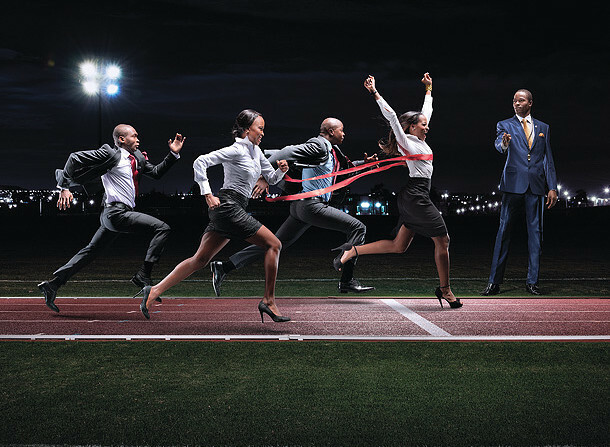 All individual images on this shoot were captured at 3200th/sec and 4000th/sec shutter speeds using Elinchrom Rangers, Nikon Speedlights, Elinchrom Softboxes and PocketWizard TT1 and TT5 radio slaves on Hypersync mode. Short flash duration strobe heads simply cannot freeze this kind of high speed work and although i started the shoot using Action heads, i soon turned to my tried and trusted S heads and Hypersync mode. Herein lies the importance of having enough kit on hand to cover all your bases. Often your well thought out plans don’t quite come together as well as they did on paper. This is when your backup plan should be at the ready. We need to go seamlessly from one setup to another in the interests of getting results. Client is not interested in the problems the photographer faces on set. They contracted you to do the job for your technical PLUS problem solving ability. Kit is expensive and while saving for those big purchases, rental is the way to go. Find a rental company where you can source most of the kit needed, and establish a good relationship with them. This will be invaluable when deadlines are tight and you only have some hours before shoot day to arrange rental kit. If you have an account with the rental company, you can collect and not have to deal with invoices and payment procedures when your time needs to be concentrated on testing, charging and packing for shoot day. 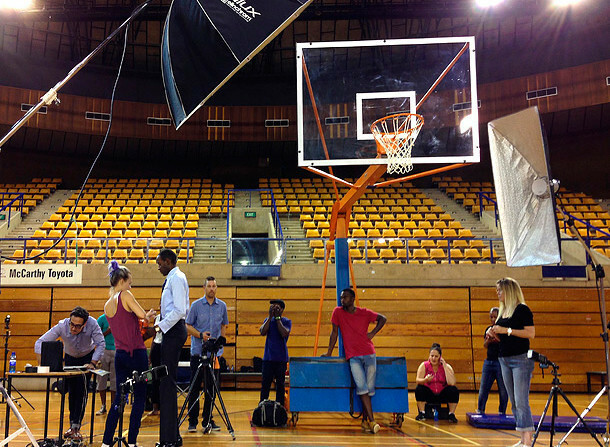 On this shoot my rental quota simply consisted of the Avenger A1045CS stand, fitted with a boom arm. This is a superbly built and versatile Combo Boom Arm Stand. It is fitted with a levelling leg which in itself is an extremely good ally when having to position lighting on uneven surfaces. Overhead lighting is a great way to simulate sunlight and achieve a more natural lighting effect when shooting outdoors. 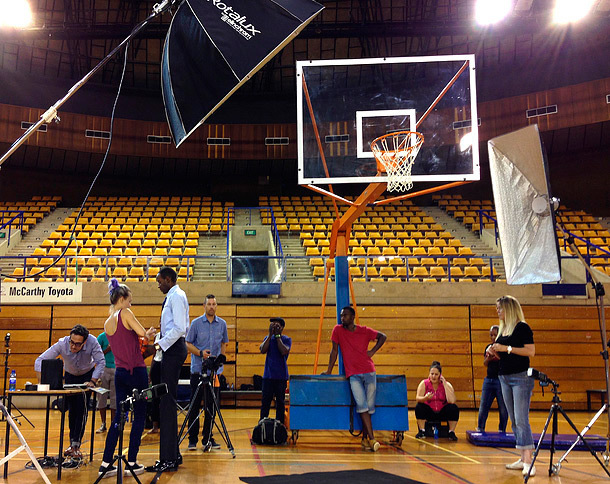 On the featured shoot, the overhead lighting simulated arena lighting which is generally elevated high above the seating arrangements – a very important lighting detail that adds authenticity to the image. 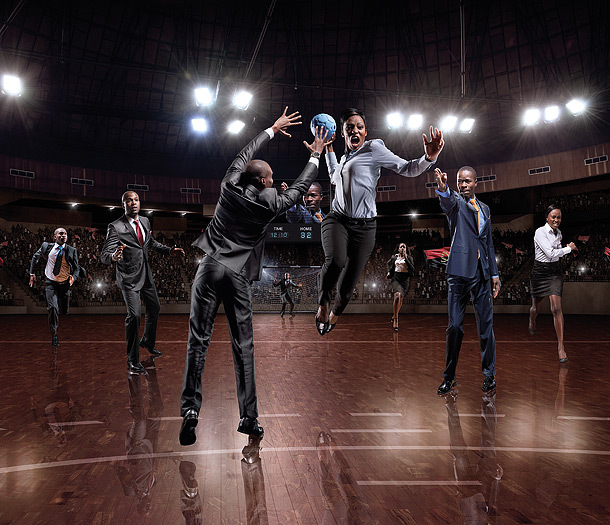 Once the four shoots were completed, and final image selection was done, the high-res NEF files were supplied to master retoucher Paul Vermeulen who used his extensive experience to combine athletes, backgrounds and detail elements into final print composites. Ad agency, art director, production team, stylists, hair and make-up artists, wardrobe, photographic assistants, models/athletes and catering are all professionals who add immense value to the success of the project. 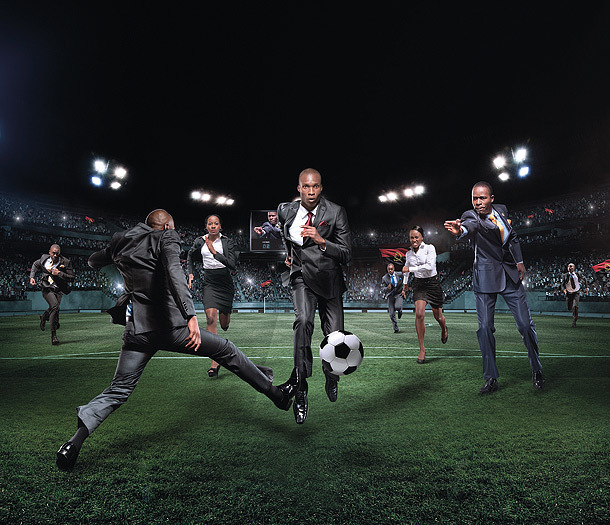 Establishing a team of professionals you can rely on is fundamental to your success as photographer. It is their talent and ability that puts you in the position to grow as a photographer and deliver work to the standards that ad agencies require. Thanks again for checking in – Ben.